Reduces Risk of Shoulder, Elbow and Wrist Strain - Regular size keyboards with integrated numeric keypads on the right make reaching for the mouse on the right-hand side an ergonomic risk factor. The further the reach for the mouse (from the dominant hand home row, over the navigation keys, over the numeric keypad), the greater the risk of injuries to the arm and shoulder due to overreaching. 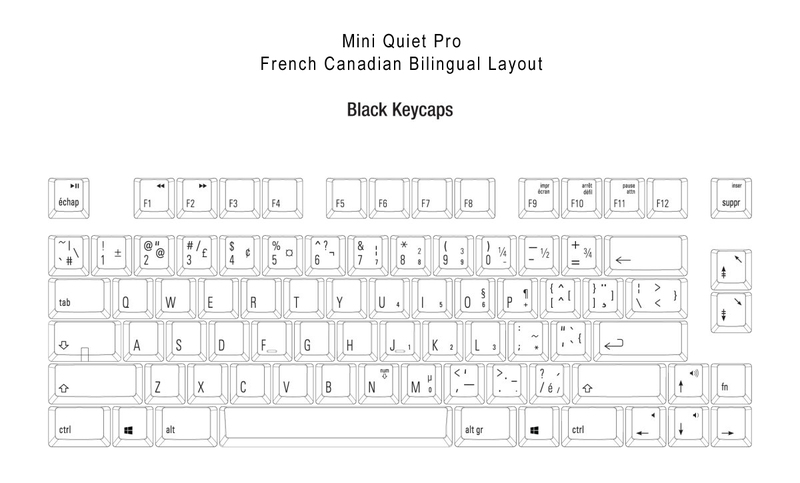 The Mini Quiet Pro eliminates this potential risk factor by eliminating the built-in numeric keypad and replacing it with an "embedded" numeric keypad. Reduces the Potential for Wrist Extension - The Mini Quiet Pro features a profile that incorporates a slight negative inclination on the keycaps of the first 3 rows of the keyboard, with the upper 3 rows being just slightly higher with a very nominal positive inclination to facilitate easier access. This design permits users to maintain their wrists in a flat neutral position while performing the majority of their work. 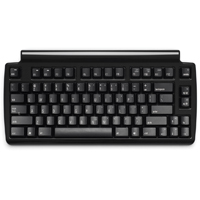 This distinguishes the Mini Quiet Pro from most keyboards which have a clearly positive profile resulting in the function row being significantly higher than the bottom row on the keyboard (even when the legs at the back are not deployed). Note: Regardless of the devices in use, wrist extension cannot be prevented if the work surface is either too high, or too low. 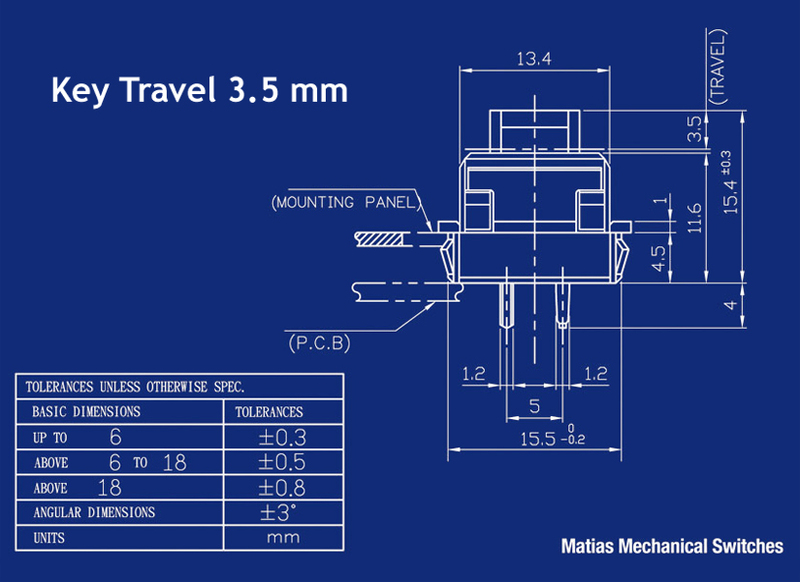 Learn More About Improper Work Surface Height. Full Size Sculpted Keycaps with Standard Spacing and 3.5mm Key Travel Distance: Standard sized sculpted (concave) keycaps, standard key pitch (the spacing between key caps) and 3.5 mm key travel (how far the key moves up and down) results in no learning curve when transferring keyboarding skills to this keyboard. 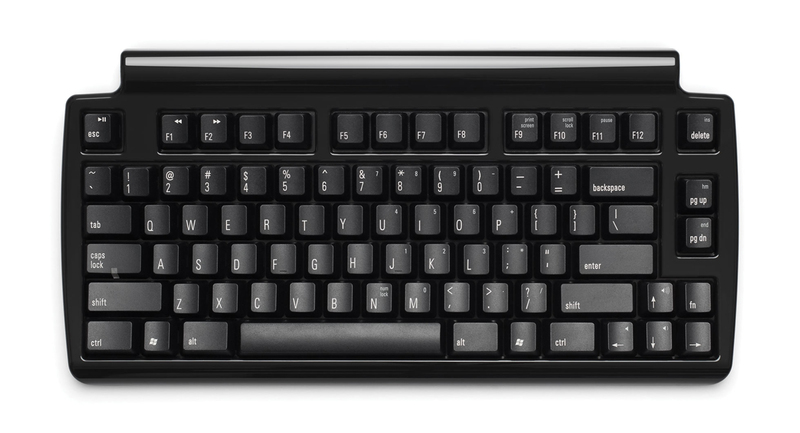 On most compact keyboards, the function row (F1-F12), directional arrow, and modifier keys (ALT/CTRL/SHIFT) are usually narrower than standard resulting in keying errors and frustration. This is not the case on this keyboard where all 81 standard keys preserve all touch typing skills previously acquired. Effectively Neutral Profile: The effectively neutral profile ensures that the alpha rows are not positively inclined, and the numeric and function row is only nominally higher. 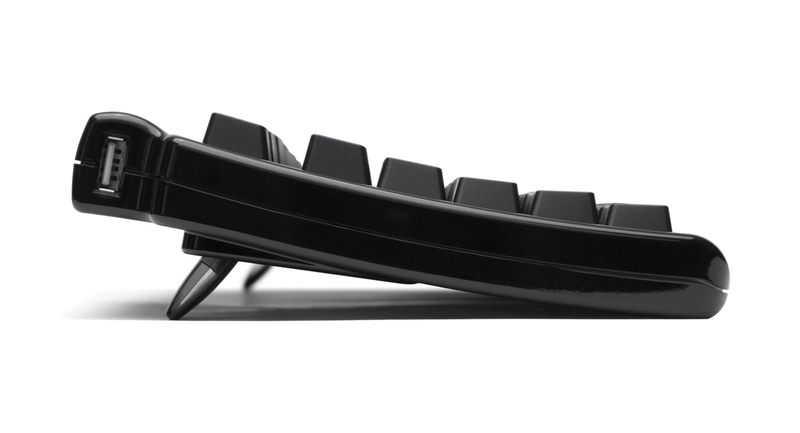 This distinguishes the Mini Quiet Pro from most keyboards which have a clearly positive profile resulting in the function row being significantly higher than the bottom row on the keyboard (even when the legs at the back are not deployed). Concave Arc Keycap Inclination: The inclination of the tops of the keycaps follow a very shallow "concave" arc, which improves tactility for the letter rows by maximizing finger pad contact on the keycaps, and improves reach for the upper rows (number and function row). Mechanical, But Quieter: The Mini Quiet Pro is the quietest mechanical keyboard currently available. 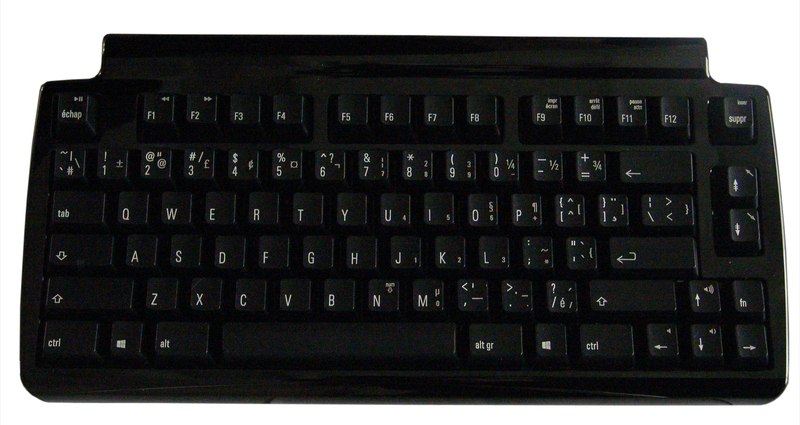 N-Key Rollover (Anti-Ghosting Circuitry): Unlike most keyboards, this feature permits users to type as fast as they are capable of with no fear of lost or incorrectly generated keystrokes. 3-Port USB 2.0 Hub: The built-in hub makes it convenient to plug in a mouse, flash drives or any other USB devices. Laser Etched Keys: Not only will the keyboard function for a very long time, the legends will survive as long as the keyboard as they are burned into the keys with a laser. Detachable Keyboard Cables: This keyboard comes with a longer "home" cable and a shorter "travel" cable, so the home cable can remain attached to the desktop (when going on the road) and the travel cable can be left in a laptop bag for when the Mini Quiet Pro is needed on the road. Audio and Media Controls: Through the Fn modifier key, access is provided to controls for Volume, Play / Pause, Next Track, and Previous Track. Legending: The numeric keypad numbers are legended on the upper right corner of the keys. There are no navigation legends. Press and hold the Fn key and then press the desired key (i.e. shift access). There is no Num Lock indicator light. To Deactivate the Numeric Keypad: Press and hold the Fn key and then press the desired key (i.e. shift access). There is no Num Lock indicator light. Press and hold the Fn key and then press the NumLock key (i.e. toggle access). With NumLock On: The embedded keypad will generate numbers if the NumLock is active and the the Fn (Function) key is depressed. With NumLock Off: The embedded keypad will generate navigation keys if the NumLock is inactive and the the Fn (Function) key is depressed. To Get Numbers While holding the Fn key down, and with NumLock toggled on, press the appropriate key on the embedded numeric keypad. To Get Navigation While holding the Fn key down, and with NumLock toggled off, press the appropriate key on the embedded numeric keypad. As you type, pay attention to when the keystroke actuates on the screen and learn to associate it with the feel of the key as it is depressed. As you learn how far and hard to press a key, you will be able to become efficient at using just enough force to exceed the peak force of the switch ("QUIET CLICK") and generate a keystroke every time, without bottoming out at the end of the keystroke against the keyboard ("CLACK").